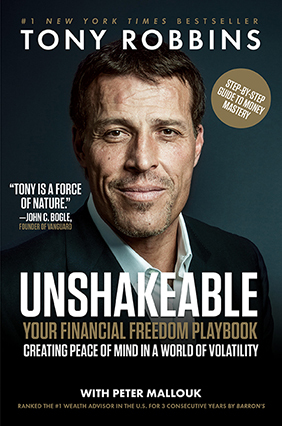 If you are confused by the financial world just like many of us, the latest book by Tony Robbins, Unshakeable, is a good resource to help you make sense of it. This is a great book to recommend to your children and offers those of us who are worried about retirement strategies and a pep talk that it is never too late. Robbins, who has written the book with Peter Mallouk, attempts to take the mystery out of investing by providing you with simple tools and strategies in an easy to understand presentation. How to put together a simple, actionable plan that can deliver financial freedom. What your 401(k) provider doesn’t want you to know. How a few simple steps can add a decade or more of additional retirement income to your savings. Strategies from the world’s top investors on how to protect yourself and your family. How to maximize profit from the inevitable crashes and corrections to come. The core four principles to help you maximize the upside and minimize downside. Lamenting that millennials are not investing in the stock market like generations before him, this book might provide a playbook for them. Rule Book for Wealth & Financial Success … if you don’t know the rules, you can’t hope to win. Financial playbook including basic principles he learned from interviewing more than 50 of the world’s greatest investors and how to “slay the bear,” concepts for how to meet a bear market head on without fear. Key principles to guide your through all investment decisions. Basic financial information in simple terms are here like what’s a correction really mean? What’s the difference between a bull and bear market. Hidden fees you may not even know about. Checklists for building your financial legacy and ways to save on taxes. An especially thought provoking section on how do you achieve ultimate happiness. Is it really by amassing large amounts of money or is there a way to achieve that beautiful state right now? “Real wealth is emotional, psychological, and spiritual,” Robbins said. Throughout Robbins’ book, with its easy-to-read style, you will find plenty of ideas for improving personal finances, whether you want to share it with your kids or need help now.